Despite his professed solidarity with the poor and disenfranchised people of the Democratic Republic of Congo, aspiring president Moise Katumbi lives a lavish lifestyle completely at odds with his public persona. With private planes whisking him to fancy parties with the cultural elite, with his penchant for exporting business that would develop the country he claims to love, it is safe to say that the ex-governor of the wealthy mining province of Katanga, knows little about the suffering or poverty of the Congolese people. Let’s focus on his business dealings. According to a 2014 report in the Belgian weekly Marianne Belgium, after returning from exile in 2003, Katumbi relaunched Mining Company Katanga (MCK), the business he founded in 1997. In November of 2004, MCK signed a deal with a Canadian corporation named Anvil Mining, a company that was implicated in conducting paramilitary operations against the Congolese people in order to protect its assets. Anvil’s despicable actions did not seem to bother Katumbi, who continued working with them. In fact, Katumbi later obtained three more mines in the northeast province of Lubumbashi, the capital of Katanga: Kinsevere, Tshifufia and Nambulwa. Between November 2005 and March 2007, MCK—that is, Katumbi--sold 95 percent of these rights to Anvil, netting a whopping $61.3 million. 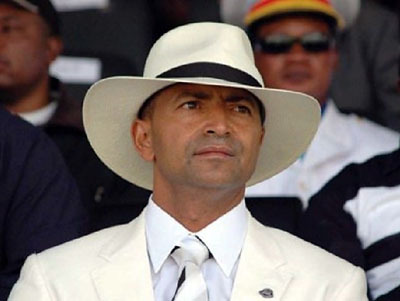 Shortly thereafter, Katumbi became governor of Katanga. But that’s not all. On November 13, 2006, Katumbi created an offshore company named GKMIC SA in Panama, a notorious tax shelter. It is headquartered at 8 Mahenge Avenue, in Lubumbashi—the same address where Katumbi’s trucking business, Hakuna Matata, is based. Coincidence? But Katumbi didn’t want anyone to know what he was really up to. So he used the name “Moses Katumbi D’Agnano,” an alternate identity that he has utilized before, to create GKMIC. His proper title? Managing Director. The address? Mahenge Avenue, Lubumbashi City, DRC. According to the register of Panamanian companies, GKMIC is still alive and well. It’s worth noting that the other two directors of GKMIC--Ultra Mega Development SA and Fairfax Invest Corp. SA--are based in the British Virgin Islands, another tax haven. In 2010, the companies were linked to a Colombian businessman who was arrested in Panama two years earlier and deported to New York for money laundering of drugs. (The businessman plead guilty). One can only speculate on why Katumbi created this offshore account. Was it to hide the $61 million dollars from the Anvil sale, and from his constituents in the Congo? It seems likely. And that is not the sort of person fit to lead.